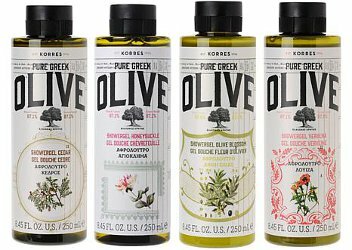 From Korres, a shower gel collection in "Pure Greek Olive Oil" featuring four scents: Olive Oil & Cedar, Olive Oil & Honeysuckle, Olive Oil & Olive Blossom and Olive Oil & Verbena. "This quad of creamy foam shower gels is enriched with olive leaf extract, aloe and other key ingredients that gently cleanse and help maintain natural hydration levels." Four 250 ml bottles for $29.50 at HSN. It is at this same spot that two new scents of antiquity, Sage and Coriander, revived by KORRES for the National Archaeological Museum, will be revealed this spring to mark the one-year anniversary of the exhibition. A milestone in the exhibition’s life cycle, as together with the new scents, a statue of Goddess Aphrodite of Roman times, will emerge from the storerooms of the Museum for the first time to light up the space and delight visitors with its charm. – Korres adds two more scents to the collection they released last year for an exhibit at the National Archaeological Museum in Athens. Read the museum's press release at THE SCENT OF ANTIQUITY REBORN, or see the page for the new exhibit, which will run from May through December, The countless aspects of Beauty. Three fragrances – rose, coriander and sage – were created for what museum officials are calling a first sensory experience of antiquity based on scent. The archaeological experiment required 18 months of research, both in and outside the laboratory, said Korres, the Greek natural cosmetic firm tasked with reviving the “primordial, one-dimensional” perfumes. — Read more at Scents of antiquity revived for exhibition at Athens museum at The Guardian. 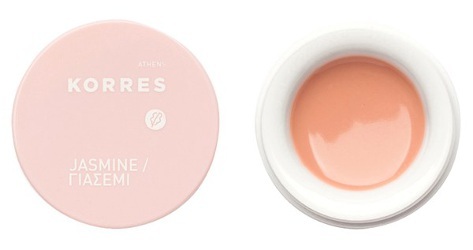 For anyone who is still wishing for a tub of that Rodin lip balm but doesn't want to spend so much, here's a cheaper alternative: Korres Jasmine Lip Butter. "This rich butter leaves lips deeply moisturized, supple, and kissably soft. Korres Lip Butters are formulated with natural oils and extracts to soothe and condition lips. Shea butter and rice wax provide lasting hydration and softness. This shiny, juicy pop of color comes in an array of "flavors" and is ideal for dry lips." (I have not smelled or tested it, but I can vouch for the Korres Jasmine Shower Gel.) $12 for 6g at Sephora. 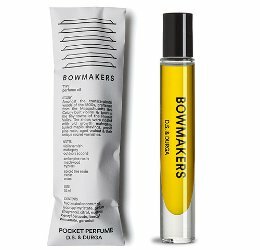 Part three in our eight-part series on fragrance related holiday gifts features scented items for men, although there are plenty of “unisex” ideas in the other articles, and as always there are probably a few things here that women might like. Do add any of your own recommendations in the comments!